AS THE TREASURE STATE, Montana is known for its mountains and extensive natural resources, such as copper, silver, gold, coal, lead, zinc, oil, limestone, antimony, phosphates, and gypsum. 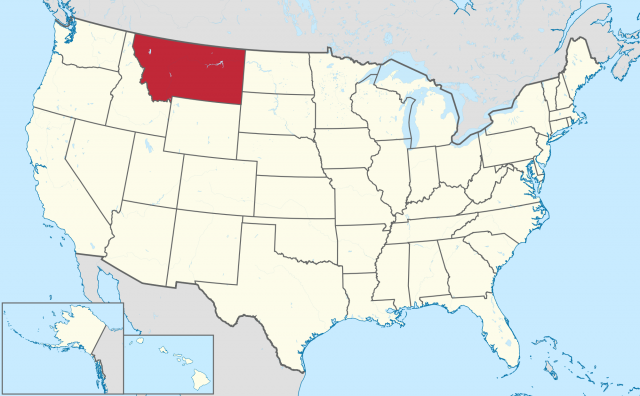 This mountain state encompasses 147,046 square mi (380,821 square km) of land area; Montana is the fourth largest state in the UNITED STATES, but it is 44th in population, partly because parts on the state are virtually inaccessible. The state is approximately 630 mi (1,014 km) east to west and 280 mi (450 km) north to south. Montana is bounded on the north by CANADA, on the south by IDAHO and WYOMING, on the west by Idaho, and on the east by NORTH DAKOTA and SOUTH DAKOTA. The ROCKY MOUNTAINS cover the western third of the state. The other two-thirds of Montana are covered with gently rolling hills. Montana, which became a territory in 1864, was admitted to the Union in 1889 as the 41st state. Yellowstone National Park, which covers 2,219,791 acres (898,317 hectares), brings approximately 3 million visitors a year to Montana. In addition to the capital city of Helena, Montana’s largest cities are Billings, Missoula, Great Falls, Battle, Silver Bow, Bozeman, Kalispell, Havre, Anaconda-Deer Lodge County, and Miles City. The highest point in the state is 12,799 ft (3,901 m) above sea level at Granite Peak. The lowest point in Montana is 1,800 ft (548 m) above sea level at the Kootenai River. Geographically, the eastern three-fifths of Montana falls within the Great Plains, while the remaining two-fifths of the state are part of the Rocky Mountain region. As part of the Interior Plain of North America that runs from Canada to MEXICO, Montana’s Great Plains section is covered with gently rolling land interspersed with hills and river valleys. Bear Paws, Big Snowy, Judith, and Little Rocky Mountains are found within this area. In the southeastern section, Montana’s badlands are dominated by red, yellow, brown stone formations. The western area of Montana is dominated by mountains, flat grass-covered valleys, and fir, spruce, and pine forests. Valleys in this region may spread out for as much as 40 mi (64 km). Some 50 mountain ranges are located in the Rocky Mountain region, including the Absaroka, Beartooth, Beaverhead, Big Belt, Bitterroot, Bridger, Cabinet, Crazy, Flathead, Gallatin, Little Belt, Madison, Mission, Swan, and Tobacco Root. Soils in the mountains tend to be poor and thin, unlike the more fertile areas of the plains. Grama, buffalo, and bluestem grasses are common in Montana. The Continental Divide separates Montana into two distinct climates. Eastern Montana has a cold, continental climate. The temperature in the west is modified North Pacific maritime. Montana mountains may be covered with snow for as much as eight or ten months a year, and the Great Plains area is beset with freezing arctic air several times each winter. The average temperature in the state ranges from 70 degrees F (21 degrees C) in the summer to 8 degrees F (-13 degrees C) in the winter. While western Montana may receive as much as 43 in (109 cm) of rain annually, the eastern section receives less than 20 in (51 cm) per year. Earthquakes are not uncommon along the fault lines that lie within the Rocky Mountain region. Among the 50 states, Montana is the only state that has rivers draining into the Gulf of Mexico, the Hudson Bay, and the PACIFIC OCEAN. Montana’s major rivers are the Clark Fork River, the Missouri, and the Yellowstone. The state’s major lakes are Lake Flathead and Fort Peck. At the highest levels of the states, glacial drift may still be found. Agriculturally, grain is Montana’s major crop. Wheat, barley, rye, oats, hay, flaxseed, sugar beets, potatoes, and livestock bring in substantial revenue for the state. Other revenue evolves from mining, the tourist trade, dude ranching, hunting, fishing, and skiing. Timber is also a major industry for Montana because two-thirds of the state’s forests are suitable for commercial use. The most valuable timbers are western yellow pine, Douglas fir, larch western white pine, and spruce. In addition to timber, Montana’s major manufacturing industries deal with food products, wool, and printing and publishing. Mountain goat, bighorn sheep, elk, moose, mule deer, white-tailed deer, grizzly bear, black bear, mountain lion, and fox frequent Montana’s mountains. Other areas provide homes for mule deer, pronghorn antelope, coyote, and various game and waterfowl.